Search engines provide two types of lists of results in response to a given user query: the organic results (also called "natural" or "free" results) and paid listings (sponsored ads). These two types of lists are independent and the ads are highlighted by the phrase "Sponsored Links" which appears above them in the search results page. The goal is to generate traffic to your Web by posting sponsored links on major search engines (Google, Yahoo and Bing). Online Advertising can be in various formats such as basic text ads, image ads in various sizes, stream audio or video and interactive ads. You can also select many different targeting options for ads, such as specifying the user's device (a computer or a SmartPhone), location, language or demographic. While search engine marketing is exclusively concerned with placing ads on Search Engines, online advertising as a whole is much broader. The possibilities of Online advertising includes placing ads on any type of Web such as blogs, online magazines, news, opinion, leisure and shopping Sites. 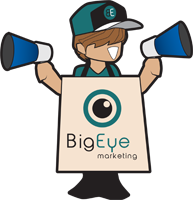 Big Eye Marketing has a team of specialists trained in creating Search Engine Marketing strategies that will help you define the advertising strategy most suited to your needs. 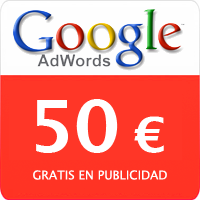 100� IN GOOGLE ADWORDS FOR FREE! We give you 100� in Ads for creating your first campaign with us.